For this month’s Week on the Wrist feature, we were sent this watch from Achtung Time. Their range of Bell and Ross inspired oversized timepieces start at $660, and are produced in strictly limited runs of ten watches at a time. How did the Achtung Time Classic Yellow fare in the seven days we wore it? Right, there is something we need to address right from the off: the Achtung Time Classic Yellow is not for everyone. There: we said it. It is a large slab of metal with bold – or some would say garish – colours. If you don’t like it, you’re not going to buy it no matter what we say in a review, but if you do then you will want to know what you are getting for your $660 – and that is what our review will focus on. First impressions are strong: the watch is presented in an attractive and well make zip up travel case, which includes a soft bag and a cleaning cloth as well as the watch. A bespoke case is handy for a watch that is unlikely to fit in your standard watch box! The watch itself is apparently German designed, but I did not see many Teutonic traits – rather more influence from its Singaporean heritage. This is a watch that will hold more appeal to the young and vibrant than the more experienced watch collector: it is a fashion piece and, as such, it certainly makes a statement. It wears more comfortably than we expected, despite the vast expanse of flat, square metal on the back. This is mainly due to the lack of lugs. The downside of the low strap-fixing position is that it feels heavier than its 140g weight. 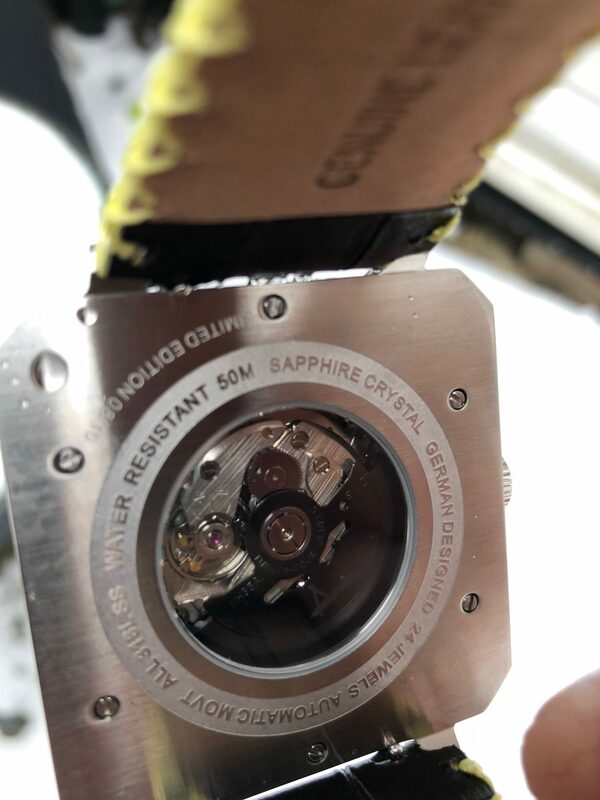 It was a problem tucking it under a shirt sleeve – although other watches are of a similar thickness, the perpendicular angles prevented it from sliding smoothly in place. 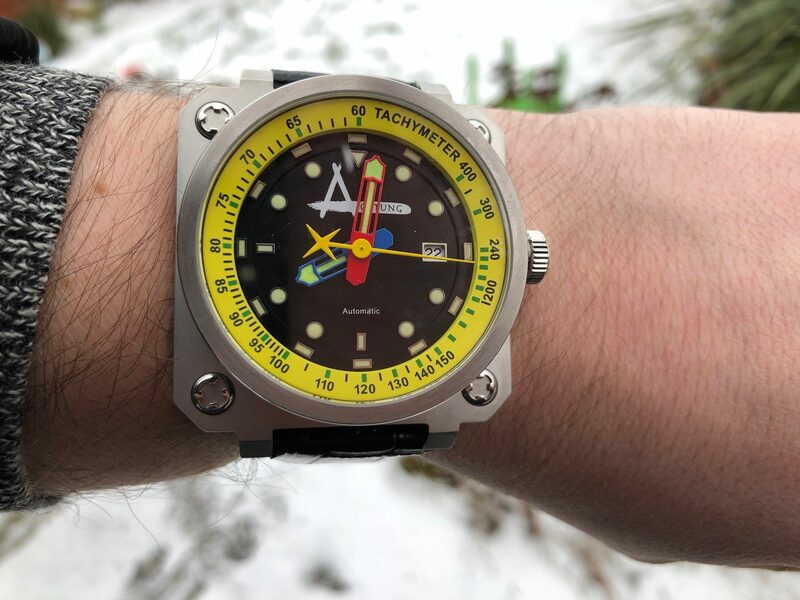 Of course in the real world, we’d never wear this to the office, which meant we were disappointed at the mere 50m of water resistance which would mean it is totally unsuitable for anything but light water immersion. We can imagine this going down a storm as a holiday watch for the young and reckless, but might not stand up to the punishment they would inflict on it at the beach! The watch is housed within a 48mm square steel case, which means it wears even bigger than you might expect. The four decorative screws in the corner were pleasingly well-aligned. Sapphire crystals on the front and back protect the dial and show off the open case back. The 14mm thickness seemed rather excessive – many watches are of a similar thickness but the brutal way in which the dial housing protrudes from the case’s square base emphasises its height and made the watch look cumbersome. A Seiko automatic movement is used in the Achtung Time watch. These are good movements, popular in microbrands, and servicing will not be an issue if it ever does break. However, they are not finished decoratively and so compared to other watches in this price range it looks rather plain through the display window. The dial and hands are finished with Superluminova, for a pleasant glow in the dark. The sheer variety of colours and patterns made it hard to tell the time at a glance, although we suspect that this watch is not worn by those wanting timekeeping accuracy above all else! The Achtung Time logo is printed, not embossed, and the date wheel is a standard white one at 3 O’clock. 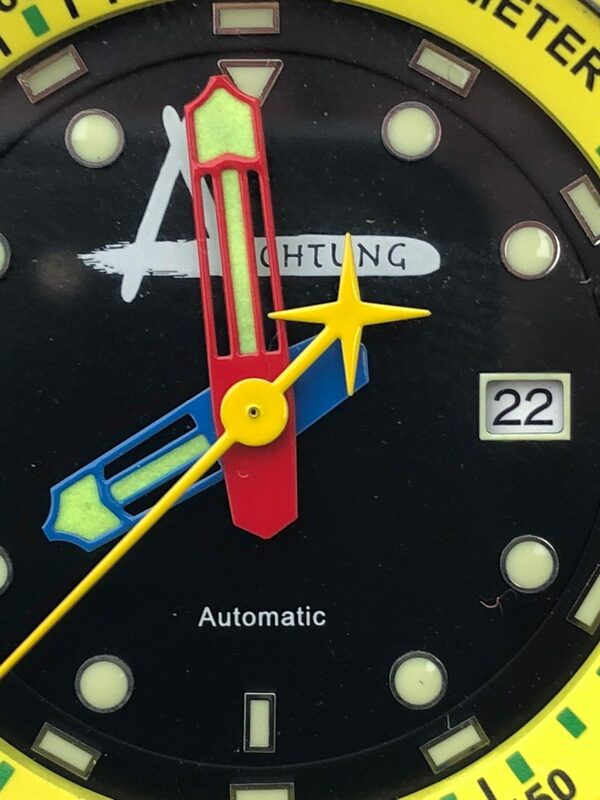 Achtung Time have chosen to add a Tachymeter to the rehaut – although the watch is not a chronograph so it is for decoration only. A tachymeter only works with a stopwatch centre seconds hand. For this kind of money, we are used to seeing a higher-quality dial with more embossed or applied features. The strap was functional but ultimately a little disappointing. It is a bespoke design made of crocodile embossed leather. It is designed with small cutouts at the lug end, so it is actually wider than the watch’s lug width. This means aftermarket straps may seem a little too thin on the watch. The strap felt adequate, albeit a little “cardboardy”, but for the money, we would have expected far higher quality The buckle is nicely shaped, with a laser etched logo. What we did like was the quick change feature that means you can swap straps without a tool. 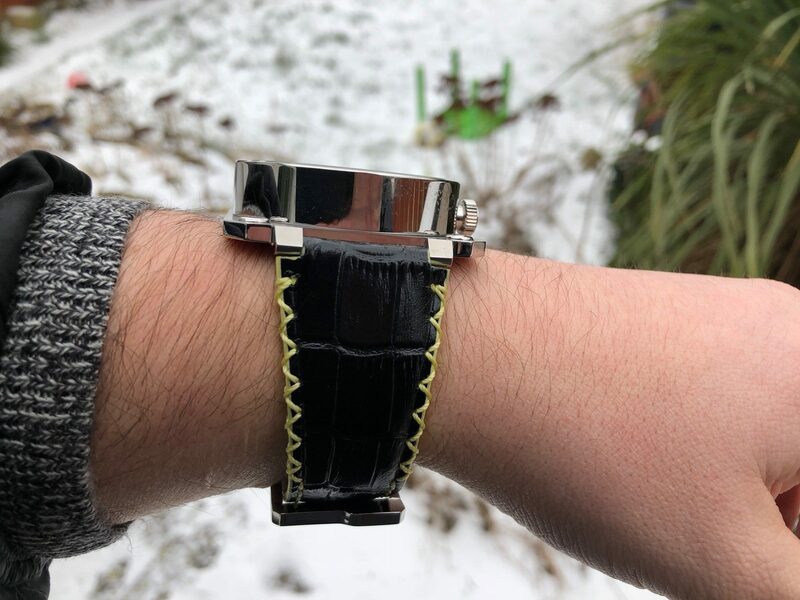 Unfortunately, we could not find a way to purchase new straps from Achtung Time’s website, and if you use an aftermarket strap if would look thinner, and lack the quick change feature – a missed opportunity, we think. Quick change straps are a superb idea – we wish all straps were made this way! Our opinion? If you like the watch and think the price is fair then go for it. We think that the price is higher than the sum of its parts, but this is a limited watch from a small brand and you won’t see anything else quite like it. We could say the same thing about other marmite brands like SevenFriday – and they have no problem selling watches at a far greater markup. Ultimately, it comes down to whether you are a fan of the design or not. Achtung Time have kindly donated this watch, number 8/10, to one lucky winner. Enter on our Giveaway page!